Chemical peels offer a non aggressive approach that may improve the superficial layers of skin to combat skin problems like textural changes, scarring, pigmentation, spots, skin ageing and acne. By applying a medicated acid to the skin, a controlled reaction to the skin may cause a series of changes, which may promote new cell growth and the removal of dead skin cells, and may also improve and hydrate the skin at the same time. Chemical peels have been around for many years and together with a suitable skin regime have given amazing results to many patients. Our clinic has carried out many peels which can only be administered by a doctor or specialist nurse. The strengths of the acids used are much stronger than in beauty salons, and therefore may achieve better results. We carry out superficial peels with little or no down time, and medium depth aggressive peels with more down to help those with more damaged skin. Glycolic acid is derived from sugar cane. Glycolic acid may loosen the “glue-like” attachments (cellular cement) that is characteristic of many skin conditions such as ageing, acne, skin discolouration and coarse texture. Removing cells may lead to better skin complexion and texture, clear pores and reduce the appearance of fine lines. Solihull Clinic uses 40% and 70% Glycolic Acid Peels which are doctor prescribed, unlike beauty salons which can only use 30% peels. Therefore, it may be possible for these peels to achieve better results. Following a skin assessment, a home skin care programme is created which is specific to the individual. Simple, safe, non invasive and in many cases unbelievably effective – glycolic peels are a fabulous route that may improve the condition of your skin without the need to take time off work. 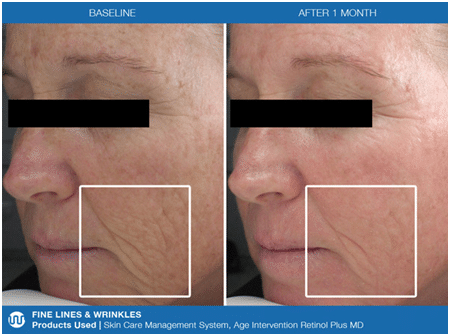 A course of six glycolic peels is recommended for optimum results over a six to twelve week period. Dr Sagoo and our Advanced Nurse practitioner will recommend a treatment programme for each individual. What can a glycolic acid peel achieve? A gentle glycolic acid peel can be performed with varying percentages of glycolic acid. After just a few weeks your skin may look brighter, clearer, and dry skin may hydrated and smooth. Glycolic acid may help to reduce cell “build up “at the lower levels of the skin. This facial procedure will resurface the skin, which may give dramatically softer, smoother texture and reduce fine lines and wrinkles. Trichloroacetic acid (TCA) is a solution which when applied can create shedding of several layers of skin, with the goal being to reveal healthier smoother fresher skin underneath. It may offer an ideal treatment for age spots, acne, freckles, poor sluggish complexion, weathered and sun damaged skin hyperpigmentation and superficial scars. Usually after a skin consultation, four peels are recommended at weekly intervals, followed by a six week course of the skin care products advised. Each treatment lasts approximately thirty minutes and peeling afterwards can occur for about three days. The peel will tighten and brighten the skin giving it an altogether younger appearance. Acne is a skin disease that involves the oil glands at the base of hair follicles. The glands are stimulated by male hormones produced by the adrenal glands of both males and females. Hormonal changes lead to the skin becoming sensitive to a hormone known as DHT. The skin responds by increasing sebum production and decreasing natural skin cell shredding, meaning that dead skin cells clump together and form a plug in the pilo-sebaceous duct. The skin bacteria start to digest the plug and produce by-products which cause inflammation. Bacteria are therefore not the cause of acne but it is their response to the changes in the skin which leads to spots. The Solihull Cosmetic Clinic has a range of products and treatment protocols designed to help control the symptoms and causes of acne. – is a delicate cleanser with a keratoplastic effect designed to cleanse the skin in preparation for treating acne where the skin is congested, with blackheads, whiteheads and where hyper keratinisation and hyper cornification may be an issue. 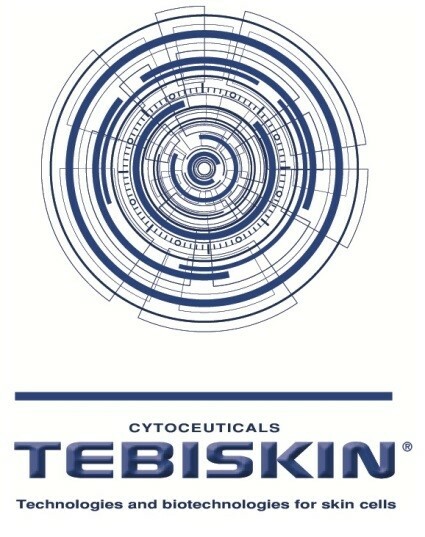 Sensitive or angry skins may benefit from Tebiskin® Sooth-clean. – is a delicate cleanser with anti-inflammatory properties specifically designed to cleanse skin post treatment. TEBISKIN® Sooth Clean is particularly appropriate for patients with angry or sore sensitive skin. Uses non detergent based cleansing agents. for the control of acne and seborrhea; especially inflammatory acne. It is designed to inhibit inflammation, have a significant antibacterial effect and slow sebum production rates. It may also exhibit a comedolytic effect to reduce skin thickening. for UV protection in acneic patients, and also helps to deliver an anti-acne activity by inhibiting bacterial colonisation and resisting the hydrolysis of tryglicerides and the consequent release of pro-inflammatory free fatty acids. SPF 30 UVa and UVb. TCA stands for tri-chloroacetic acid and is one of the original skin rejuvenation peels. They are recommended for men and women of all ages wanting to improve moderate to severe sun damage and/or signs of ageing. Superficial TCA Peels are designed as mild to moderate peels. Their strength, and therefore peeling effects can be increased, by layering the applications. The peel depth is dependent on the patient’s skin type, skin condition and desired outcome, though most patients will see a noticeable improvement after each peel. What can TCA help to improve? A course of two to four peels is usually recommended, though this is dependent on skin type, skin condition, peel strength and the desired outcome. TCA 12% peels cause a burning sensation when initially applied, which usually subsides in a couple of minutes as it neutralises. Varying amounts of sheet peeling (like sunburn) will occur for approximately three to seven days after your treatment. It is very important not to pick or peel the skin prematurely as this can lead to prolonged healing or even scarring. Makeup is fine to use, though just keeping the skin moist often looks better and assists in faster peeling time. After the skin has shed it is often slightly pink for one to two weeks, has a healthy glow, feels softer, smoother and is more even in colour. It is important to protect the new skin from the sun by using a SPF 30+ sunscreen daily. If the peeling skin is removed prematurely, prolonged healing and/or infection is possible, and may lead to a scar. Possible herpes simplex outbreak if prone to cold sores. Hyperpigmentation (darker areas of pigment on the skin) may occur, and can last one to twelve months. Unlike glycolic peels no real skin pre-preparation is required. Avoid the use of moisturisers or lotions containing active ingredients such as retinol, glycolic acids, perfumes and colours. Thereafter, continue with your usual moisturises unless advised otherwise. Your skin will tend to be a little more sensitive to the sun so keep sun exposure to a minimum. A sunscreen daily is advised. Apply foundation as you wish. Slight crusting and/or scabbing in particular areas may develop. If so, please do not rub or pick the skin as this may lead to a scar. 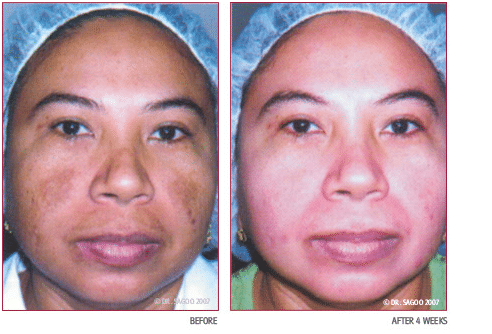 The Solihull Medical Cosmetic Clinic offers a range of peels that may help to treat hyperpigmentation skin problems. The clinic offers a full range of medical proven skin care products which are also available at our E-Shop. We only use skin products that are evidence based and not normally available in small salons or stores. It is important to have as personalised skin regime suitable for your particular skin. Dr. Sagoo will discuss with you what type of skin products are suitable for you to maintain your skin’s vitality.